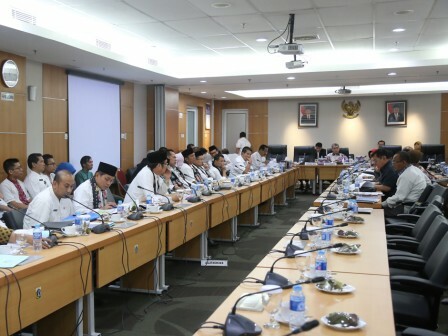 City Council's Budgeting Agency (Banggar) is fully support urban village office revitalization proposals from several Jakarta municipalities.
" I want Kelapa Dua Wetan Urban Village Office land procurement and land to be prioritized in APBD-P's KUPA-PPAS 2017"
City Council's Banggar Deputy Head, Triwisaksana encourage to prioritize urban village office revitalization. Especially, Kelapa Dua Wetan Urban Village office wide and appearance that are still conventional. "I want Kelapa Dua Wetan Urban Village Office land procurement and land to be prioritized in APBD-P's KUPA-PPAS 2017," he said in Banggar meeting, City Council Building, Thursday (8/24). According to him, there are several urban village offices besides Kelapa Dua Wetan Urban Village that are still not appropriate for service. Such as Jembatan Lima and Jembatan Besi Urban Village Office in West Jakarta. "Principally, we encourage urban village office to have minimum service standard," he expressed. Separately, East Jakarta Mayor, Bambang Musyawardhana confirmed his readiness to revitalize Kelapa Dua Wetan Urban Village Office. His side has prepared budget Rp 10 billion to provide 1,500 square meters land. "We will try to provide the land and do the design this year. Thus the construction can be s tarted in 2018," he closed.